Synthetic peptide conjugated to KLH derived from within residues 1 - 100 of Human FLAP. This antibody gave a positive signal in Human small intestine tissue lysate as well as the following whole cell lysates: U937; THP1. Our Abpromise guarantee covers the use of ab85227 in the following tested applications. WB Use a concentration of 1 µg/ml. Detects a band of approximately 14 kDa (predicted molecular weight: 14 kDa). Required for leukotriene biosynthesis by ALOX5 (5-lipoxygenase). Anchors ALOX5 to the membrane. Binds arachidonic acid, and could play an essential role in the transfer of arachidonic acid to ALOX5. Binds to MK-886, a compound that blocks the biosynthesis of leukotrienes. Genetic variations in ALOX5AP may be a cause of susceptibility to ischemic stroke (ISCHSTR) [MIM:601367]; also known as cerebrovascular accident or cerebral infarction. A stroke is an acute neurologic event leading to death of neural tissue of the brain and resulting in loss of motor, sensory and/or cognitive function. Ischemic strokes, resulting from vascular occlusion, is considered to be a highly complex disease consisting of a group of heterogeneous disorders with multiple genetic and environmental risk factors. Note=Genetic variations in ALOX5AP may be associated with susceptibility to myocardial infarction. Involvement in myocardial infarction is however unclear: according to some authors (PubMed:14770184), a 4-SNP haplotype in ALOX5AP confers risk of myocardial infarction, while according to other (PubMed:17304054) ALOX5AP is not implicated in this condition. Belongs to the MAPEG family. The C-terminal part after residue 140 is mostly unstructured. Nucleus membrane. Endoplasmic reticulum membrane. Additional bands at: 175 kDa, 75 kDa. We are unsure as to the identity of these extra bands. ICC/IF image of ab85227 stained MCF7 cells. The cells were 4% PFA fixed (10 min) and then incubated in 1%BSA / 10% normal goat serum / 0.3M glycine in 0.1% PBS-Tween for 1h to permeabilise the cells and block non-specific protein-protein interactions. 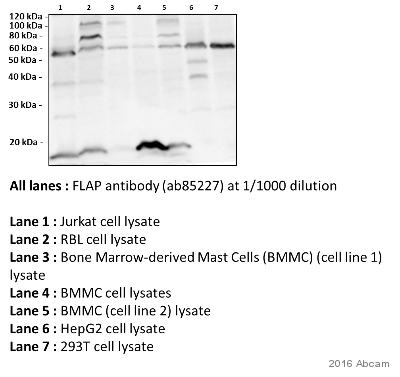 The cells were then incubated with the antibody (ab85227, 5µg/ml) overnight at +4°C. The secondary antibody (green) was ab96899 Dylight 488 goat anti-rabbit IgG (H+L) used at a 1/250 dilution for 1h. Alexa Fluor® 594 WGA was used to label plasma membranes (red) at a 1/200 dilution for 1h. DAPI was used to stain the cell nuclei (blue) at a concentration of 1.43µM. Publishing research using ab85227? Please let us know so that we can cite the reference in this datasheet.